Lovely little blossoms make their spring debut. Their elegant floral beauty is both innocent and true. The landscape is made of clear resin with streaks of white and white blossoms and moss. 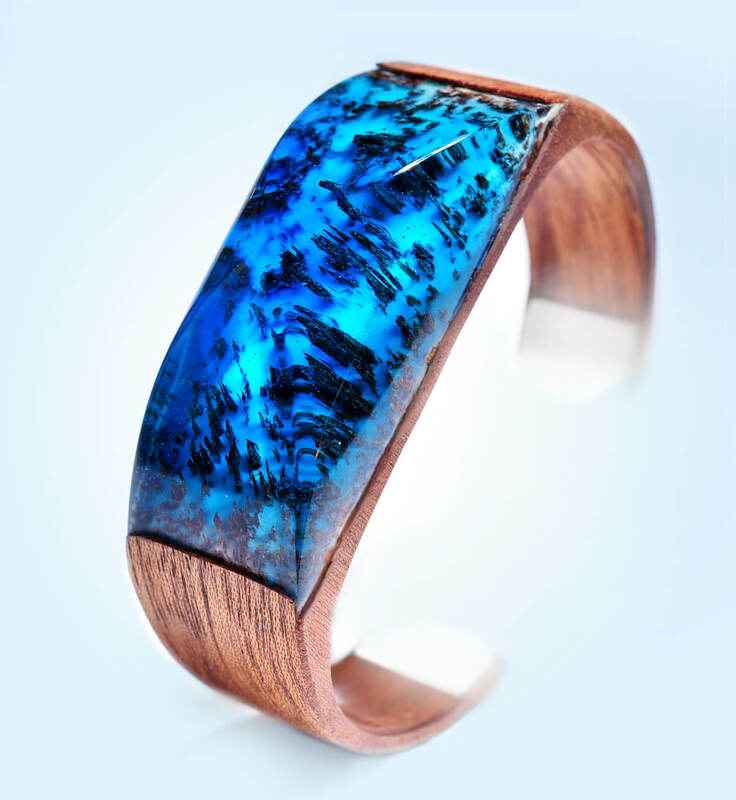 The band is koto wood organically dyed to an ash grey. Sterling 925 silver tips are added to the design completing the elegant beauty of this piece. Each piece is handmade in Canada by our Secret Wood craftsmen! After the completion of your bracelet, a high-resolution photo will be taken and sent to your e-mail address. We ensure that you are 100% in love with your choice! If you don’t see your size available or have a question about sizing, you can select the “Choose Later” sizing option and get in touch with us at askus@mysecretwood.com. 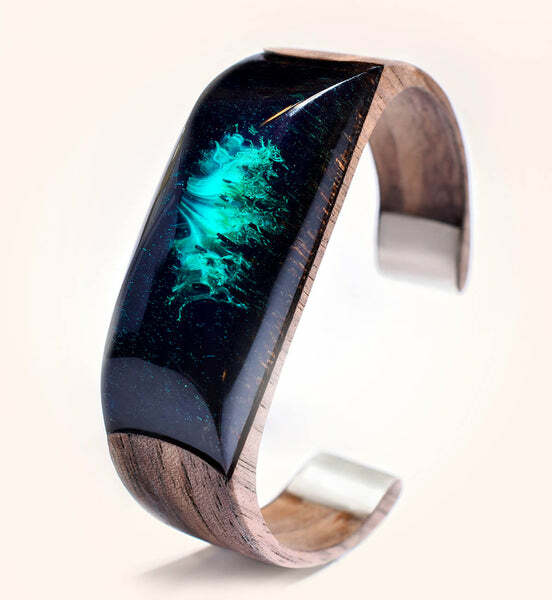 What is the bracelet made of? 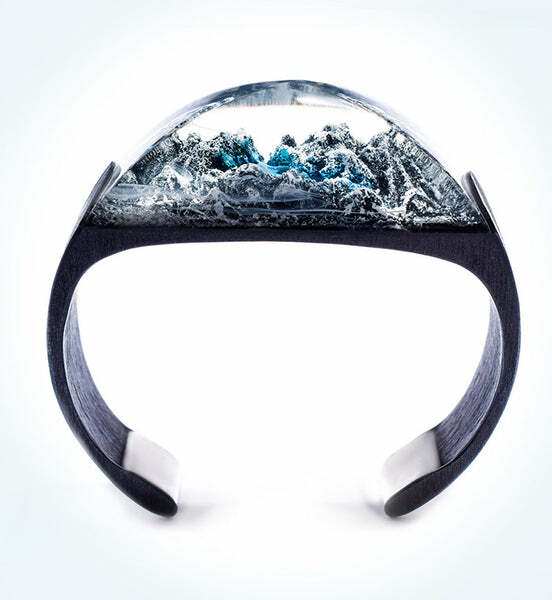 Our World Bracelets are made of a wood base with wood and resin landscape. Some landscapes include additional elements such as blossoms. Sterling 925 silver tips and embossed logo plate are added to the design completing the elegant beauty of this piece. Sizes are based on the circumference of your wrist. To find your best fit, measure your wrists circumference. Compare this measurement to the sizes below and choose your corresponding bracelet size. What kind of silver do you use? We use a durable 925 sterling silver in all our silver jewellery. This material is an extremely durable alloyed metal. Our sterling silver contains no traces of nickel or lead. This material is often a great option for people with metal sensitivities! How does the pre-order work? The pre-order will end on July 26th or sooner if crafting capacity is reached. Once the pre-order has ended, we will update you on the crafting and shipping timeline. We ship worldwide to all countries. Shipping and taxes will be calculated at checkout. Shipments outside of Canada may incur customs fees depending on the destination country. If you are unsatisfied with your purchase for any reason, you have 30 days (from the date the product has been received) to request an exchange or a full refund. In order to complete return or exchange, we require proof of purchase. We will also replace an item if defective or damaged upon arrival at no cost. Secret Wood will repair or replace manufacturing faults free of charge up to 1 year from the original date of purchase. Please retain your receipt, as the original proof of purchase is the warranty.